LIMA, Peru, December 1, 2014 (ENS) – Climate negotiators from around the world are gathered in Lima today to hammer out a new universal agreement limiting greenhouse gas emissions to keep the global temperature from rising into the stratosphere. The negotiators have the next 12 days to agree on draft language that will bridge the divide between developed countries that emit the heat-trapping gases and the developing countries that need financial and technical help to cope with their effects – extreme weather, droughts, floods, shrinking ice caps, rising sea levels, acid oceans. All eyes are on the parallel meeting set for Paris at this time next year where the new universal agreement is scheduled to be adopted. It would take effect by 2020. 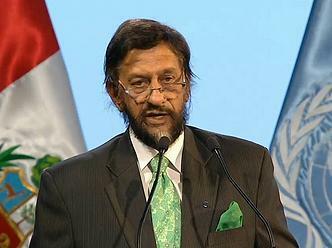 Known as COP20, the 20th Conference of the Parties to the UN Framework Convention on Climate Change, UNFCCC, brings together 196 government Parties to the treaty. Many heads of state and government will attend the high-level segment of the conference beginning December 9. “Never before have the risks of climate change been so obvious and the impacts so visible. Never before have we seen such a desire at all levels of society to take climate action. Never before has society had all the smart policy and technology resources to curb greenhouse gas emissions and build resilience,” said Christiana Figueres, executive secretary of the UNFCCC. “To safeguard this and future generations,” said Figueres, “society-wide action in concert with government contributions to the Paris agreement are crucial to meet the agreed goal of limiting global temperature rise to less than two degrees Celsius,” compared to pre-industrial levels. The two degrees Celsius goal, agreed by climate scientists from around the globe, was recognized by world governments at the UN’s annual climate summit in Copenhagen in 2009. But even in the month since the release of that IPCC report, climate change has grown more menacing. Welcoming the leadership of the European Union, and the United States and China, who have announced their post-2020 climate targets and visions, Figueres stressed that many countries are working to decrease emissions before 2020, when the Paris agreement is set to take effect. “It is hugely encouraging that well ahead of next year’s first-quarter deadline, countries have already been outlining what they intend to contribute to the Paris agreement. This is also a clear sign that countries are determined to find common ground and maximize the potential of international cooperation,” she said. President Barack Obama announced an economy-wide target to cut greenhouse gas emissions at least 26 percent below 2005 levels by 2025 and to make best efforts to reduce emissions by 28 percent. President Xi Jinping said China intends to achieve the peaking of CO2 emissions around 2030 and to make best efforts to peak early. China also intends to increase the share of non-fossil fuels in primary energy consumption to around 20 percent by 2030, he said. 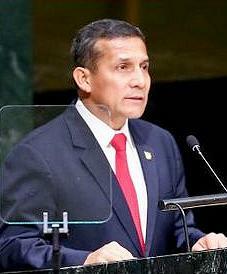 In Lima, Figueres said that all governments should work towards streamlining elements of the draft agreement for Paris 2015 and explore common ground on unresolved issues in order to achieve a balanced, well-structured, coherent draft for the next round of work on the text in February next year. 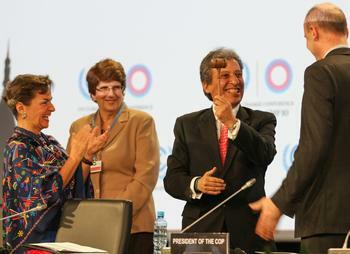 She observed that the political will of countries to provide climate finance is growing stronger. At a conference held in Berlin last month, countries made pledges towards the initial capitalization of the Green Climate Fund totaling nearly $9.3 billion. More recent pledges took this figure to $9.6 billion, so that an initial $10 billion milestone is within reach, Figueres said. The international aid agency Oxfam is urging all countries to use the COP20 Summit in Lima to resolve the impasse over “climate finance,” and make success possible at the critical Paris talks in December 2015. In a new report, “Breaking the Standoff,” Oxfam details how current pledges are out of step with the size of the need in developing countries. Developed countries promised to mobilize $100 billion per year in climate finance by 2020. If progress is made on climate finance, the clean development that poor countries can achieve could be spectacular. Peru, for instance, could increase its GDP by nearly one percent more than business as usual while halving its emissions at the same time. But Oxfam says the $100 billion goal should be only the beginning, noting that sub-Saharan African countries alone will need $62 billion per year to invest in climate adaptation. But the aid agency, along with many other stakeholders, hope that an effective global climate agreement could unlock hundreds of billions in private investments and move the world onto a low-carbon path.